St Francis was born in the Italian town of Assisi in 1182. He was the son of a cloth merchant and dressed in such a way as to display wealth and excess. He was fastidious and particularly avoided ‘lepers’, whose smell and filth were obnoxious to him. He would make a wide circuit around the leprosarium which lay in the valley below Assisi. In this he was in tune with the view of society at that time that ‘lepers’ did not count as people but were a menace to public health. There was a stigma attached to the disease and this included the judgement that ‘lepers’ were morally degenerate. Francis could have lived with this attitude except that the Gospel of Jesus Christ had taken hold of him. He pondered constantly words like “For if you love those who love you, what right have you to claim any credit? Even the tax collectors do as much, do they not?” One day while riding his horse on the plain below Assisi he came across a ‘leper’. The nagging inside came to crisis point in this meeting and Francis answered the words of Christ by getting off his horse and embracing the man. Now he himself became a free man because there was no longer anyone to avoid; he could be brother to all people in following Christ. He founded an Order of men called the Friars Minor (which means ‘lesser brothers’) and the very name shows what Francis desired. He wanted to live as a lesser brother and for the Order to live in the same way. He wanted to do this because his Master, Jesus Christ, had come on earth in poverty to live as a brother to all people. Francis wanted to live as Jesus had, and he found that he could be brother to everyone once he had freed himself of his prejudices and natural dislikes. Thus he has been described as a very catholic man – not Catholic in a sectarian sense but quite the opposite sense: a man with universal appeal. St Francis is patron of the St Francis Leprosy Guild which funds projects that actively seek out and care for people affected by leprosy. The stigma attached to the disease still exists and people who fear they have contracted it hide away or are hidden away by relatives. 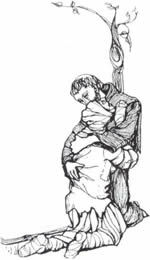 St Francis originally avoided contact with ‘lepers’, but after meeting and nursing them the experience “was changed into sweetness of soul and body”. All of us have people that we dislike, despise, write off as beyond the pale, and they become a challenge to us. The Gospel standard Jesus sets for human loving is, “You must therefore be perfect, just as your heavenly Father is perfect”. The ‘leper’ is a symbol of any person we reduce to being a non-person; as though they were not a creation of the loving Father. When we embrace that person as Francis did, we take hold of the freedom of the children of God and live at peace with ourselves.